apply The ::apply signal is emitted when the apply button is clicked. cancel The ::cancel signal is emitted when then the cancel button is clicked. close The ::close signal is emitted either when the close button of a summary page is clicked, or when the apply button in the last page in the flow (of type Gtk.AssistantPageType.CONFIRM) is clicked. prepare The ::prepare signal is emitted when a new page is set as the assistant’s current page, before making the new page visible. A Gtk.Assistant is a widget used to represent a generally complex operation splitted in several steps, guiding the user through its pages and controlling the page flow to collect the necessary data. The design of Gtk.Assistant is that it controls what buttons to show and to make sensitive, based on what it knows about the page sequence and the type of each page, in addition to state information like the page completion and committed status. If you have a case that doesn’t quite fit in Gtk.Assistants way of handling buttons, you can use the Gtk.AssistantPageType.CUSTOM page type and handle buttons yourself. The Gtk.Assistant implementation of the Gtk.Buildable interface exposes the action_area as internal children with the name “action_area”. To add pages to an assistant in Gtk.Builder, simply add it as a child to the Gtk.Assistant object, and set its child properties as necessary. Gtk.Assistant has a single CSS node with the name assistant. Adds a widget to the action area of a Gtk.Assistant. Appends a page to the self . The index (starting from 0) of the current page in the self , or -1 if the self has no pages, or no current page. True if page is complete. Gets the header image for page . Deprecated since version 3.2: Since GTK+ 3.2, a header is no longer shown; add your header decoration to the page content instead. Gets the side image for page . Deprecated since version 3.2: Since GTK+ 3.2, sidebar images are not shown anymore. Gets the title for page . Gets the page type of page . Inserts a page in the self at a given position. This function is for use when creating pages of the Gtk.AssistantPageType.CUSTOM type. Prepends a page to the self . Removes a widget from the action area of a Gtk.Assistant. Removes the page_num ’s page from self . page_num (int) – index of the page to switch to, starting from 0. If negative, the last page will be used. If greater than the number of pages in the self , nothing will be done. Switches the page to page_num . Note that this will only be necessary in custom buttons, as the self flow can be set with Gtk.Assistant.set_forward_page_func(). Sets the page forwarding function to be page_func . This function will be used to determine what will be the next page when the user presses the forward button. Setting page_func to None will make the assistant to use the default forward function, which just goes to the next visible page. This will make self update the buttons state to be able to continue the task. Sets a header image for page . Sets a side image for page . Sets a title for page . Sets the page type for page . The page type determines the page behavior in the self . Forces self to recompute the buttons state. 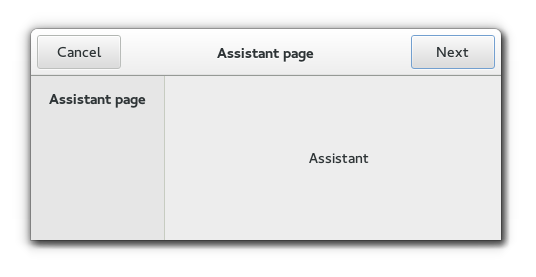 The default behavior of the Gtk.Assistant is to switch to the page after the current page, unless the current page is the last one. A handler for the ::apply signal should carry out the actions for which the wizard has collected data. If the action takes a long time to complete, you might consider putting a page of type Gtk.AssistantPageType.PROGRESS after the confirmation page and handle this operation within the Gtk.Assistant ::prepare signal of the progress page. The ::close signal is emitted either when the close button of a summary page is clicked, or when the apply button in the last page in the flow (of type Gtk.AssistantPageType.CONFIRM) is clicked. The ::prepare signal is emitted when a new page is set as the assistant’s current page, before making the new page visible. A handler for this signal can do any preparations which are necessary before showing page . True if the assistant uses a Gtk.HeaderBar for action buttons instead of the action-area.